The method of drying food in the dehydrator is still unknown in India. There are very fewer brands that manufacture food dehydrators for Indian usage. That is why people don’t have much awareness about using these machines. You might find some branded food dehydrators in the market, but they not made as per the Indian usage criteria. In the below article, we will share with you the best food dehydrator in India that you can buy. Moreover, we will also share with you some vital information that you should keep in mind while buying the best food dehydrators in India. Note: We will keep updating this list as and when new dehydrators available in India (which supports Indian Voltage system). 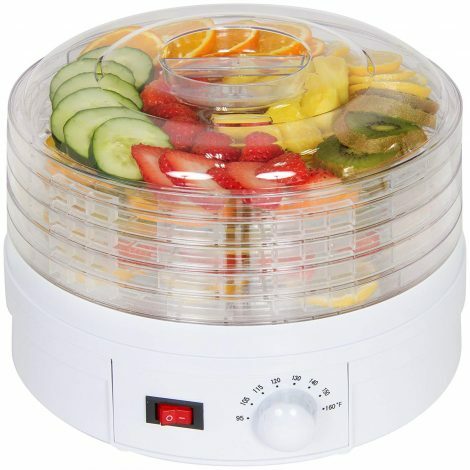 It is the best food dehydrator in India that comes with five interchangeable trays. It runs on the wattage power of 125 watts which is quite enough for drying veggies, fruits and meat. The coils inside the machine provide electrical heating that creates convection movement of air for uniformly dehydrated food. You will be glad to know that the internal temperature of the appliance for functioning can reach maximum up to 133 degrees F. It runs very quietly at the time of drying process. You get an additional instructional booklet along with the product in which you can find the number of different tasty recipes. All the controls of the unit are easy to use, and you can quickly dry the food like meat, fish, veggies, fruits, jerky, and poultry in it. Why Purchasing a Food Dehydrator in India is still difficult? You can easily find the commercial dehydrators in India that made for industrial usage. However, you cannot use these food dehydrators on a regular basis. There is very less number of Indian kitchens that have food dehydrators. There are very limited brands that manufacture food dehydrators in India. The top brands that manufacture dehydrator machines are either traded at costly prices due to shipping rates or not available in the country. Some brands that manufacture food dehydrators do not come with the BPA free trays. The BPA trays are quite harmful to the health of humans and can create health issues like asthma, kidney problems or PCOS. You can find lots of food dehydrators in the Indian market that made according to the usage by Americans. They have different shapes of plugs and runs on the different voltages of the electricity. Using such appliances is not right in India as this can damage the electrical equipment. The inappropriate shape of the plug cannot plug into the socket outlet of the Indian houses. The plugs also do not support the voltage of electricity in India that varies between 220 volts to 240 volts. Most of the food dehydrators that are available in the Indian market made in foreign whose replacement and maintenance become quite difficult to accomplish. Furthermore, the Indian buyers find it very tough to directly contact the manufacturers. Due to the absence of service centers in India, it becomes problematic to get the food dehydrator repair or change in case of an issue. Some food dehydrators come with the warranty period of 1 year without the benefit of an extended warranty. The repairing and servicing of the appliance also become a massive issue for a foreign manufactured food dehydrator in India. There is an issue of shipment charges with the food dehydrator in India. The buyer has to pay the additional shipping expenses by his or her location of ordering the product. The problem of assembling the food dehydrator also arises once the product reaches the destination. Everybody knows that buying the food dehydrators is quite expensive; particularly of American models. If you buy the economy models, then they might lack some essential features. Moreover, the repair and maintenance of the machines are also quite expensive. The additional parts are also available at the high cost. What to keep in mind While buying a Food Dehydrator in India? The warranty by the manufacturer and seller must also be considered. You have to check the compatibility of the plug, voltage as well as the frequency of the food dehydrators. You might have to buy the adapter or protector according to the machine. There should be a service center of the brand of which you are buying the food dehydrator so that you don’t find any problem in repairing and maintaining the product. So, here we reach the end of our article on “best food dehydrators in India.” Whatever food dehydrator you pick should provide you with an excellent return for your investment. In India, it is still tough to use the food dehydrators as there are very limited models and some of them have issues of voltage and frequency. But as the time passing, we might see some more new models of the food dehydrators in the Indian market with new features and compatibility so that we can use them easily in the Indian kitchens. You can see many commercial food dehydrators in the Indian market and with the increasing popularity of these machines; you might also see more household best food dehydrators for India very soon. In the above article, we have reviewed the best food dehydrator in India that is quite useful for drying food. It has lots of advantages that overshadow its cons easily. You can consider it for buying surely. Have you already purchase any food dehydrator in India? Then, do let us know you the name of the model and your experience with it. In case of any query also you can write to us in the below comment box. Don’t forget to share this article with all those who are searching for the best food dehydrator in India.